The first finger of the Newport South Jetty does not see very many SCUBA divers but if you are in for a fun and challenging test of your buoyancy skills, the shallow dive site is a great place to look for crabs at the right time of year. Sometimes seals or sea lions will come and visit you while you’re diving here, too. This dive site is so big that it is a good thing it’s such a shallow dive because otherwise you wouldn’t be able to dive it on one tank. The first finger is close to the Yaquina Bay Bridge on US101 in Newport, Oregon. The channel marker in the center of this photo is next to the end of the first finger. The highlight of this SCUBA site for us is searching for crabs in low visibility conditions common on the first finger. While many divers love the 100-200 foot visibility of Clear Lake, we enjoy low viz from time to time. Anyone who dives in Oregon and calls themselves a Pacific Northwest diver will know that we can have all sorts of visibility conditions, especially on the Oregon coast. 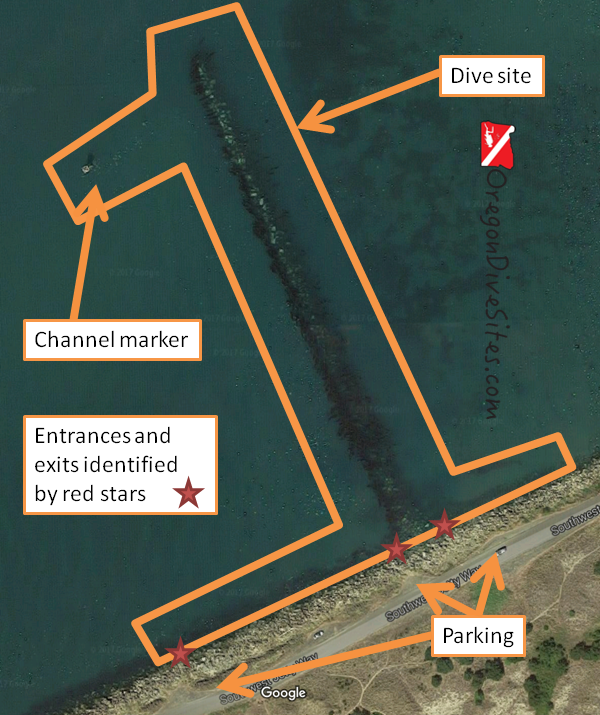 This dive site is much quieter than the other fingers along the South Jetty but curious harbor seals and very occasionally a sea lion will come up to divers here to investigate what you are doing on the first finger. We have had our fins nipped once or twice by playful harbor seals. We have not met up with a sea lion underwater yet but maybe someday soon we’ll see one under the waves. For those with good navigation skills, a visit to the channel marker to the west of the first finger can be a fun challenge. There is some sea life on the base of the marker tower. Take the US101 exit toward the aquarium and then turn west onto Southwest Jetty Way. The first finger has limited parking on the north side of the road. Only a few cars can fit here. Luckily we have usually found the dive site to be quiet and with only one or two vehicles parked there. Otherwise, you will have to walk quite a distance along the jetty road from other parking. Imagery ©2017 Google, Map data ©2017 Google. The first finger is a very large dive site compared to most of the dive sites in Newport. The channel marker to the west of the finger can make a fun navigation challenge. The site runs generally north-south with the channel marker being west of the end of the first finger. The entire site is very shallow and requires excellent neutral buoyancy skills to stay underwater. For this reason, we recommend this site for anyone who wants to really hone their neutral buoyancy skills. At the tip of the first finger, you can encounter some current although only when the tide is really running into or out of the bay. Because of how shallow the site is, it is really only good for SCUBA divers at high tide. Seals sometimes haul themselves out on the rocks at the tip of the first finger. We have also seen the odd sea lion on the end of the rocks. The South Jetty at the base of the first finger is also a good spot to check out if you have more air to burn and the tide hasn’t gone out too much yet. There are two primary entrances and exits, and one secondary entrance and exit. The two primary sites are at the base of the first finger. The secondary site is right off the western parking area. All of the entrances and exits are difficult due to having to climb over the jetty rocks. This is a shore dive. While you can maneuver a boat into this area, the water is pretty shallow and when the tide goes out, this area can become an exposed mud flat. Usually the first finger is a calm dive site. When all of the other fingers on the South Jetty are blown out due to surf and surge, the first finger is still diveable. However, in those conditions visibility can be almost zero. There is boat traffic in this area occasionally from shallow draft little boats putting crab pots out. It’s wise to fly a dive flag and move it with you as you swim along underwater. We have our favorite dive flag that we use listed on our Gear We Use page. At this dive site, we occasionally get 15 feet of visibility but usually more like 5-10 feet. 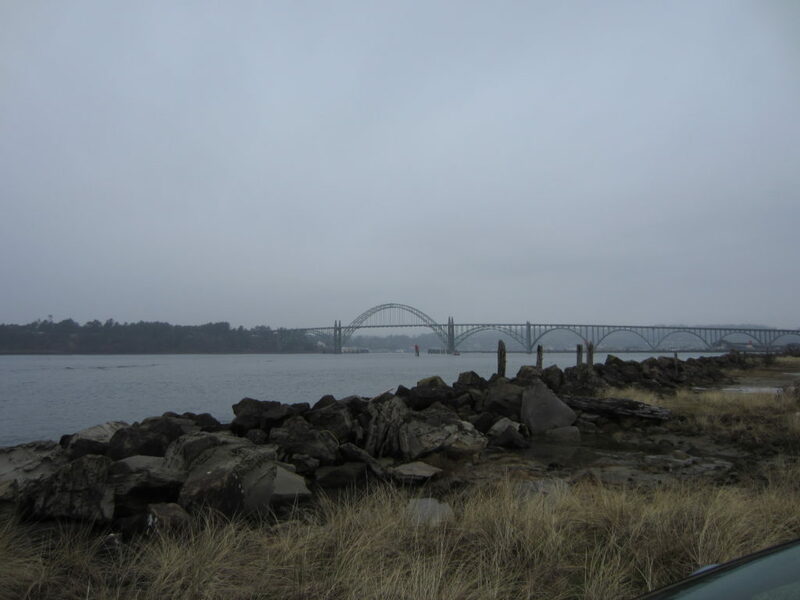 When water is pumping out of the Yaquina River or during a storm, visibility can be zero. In certain areas of this dive site, we have encountered blackout conditions from stirring up the bottom. In other areas, the bottom is sandy and will not stir up. This dive site fluctuates between 42F and 50F throughout the year. We prefer diving this site in Fall, Winter, and Spring although a SCUBA diver can enjoy the site year round. The absolute best time to dive the site is at a very high tide. If you take a shovel with you and go to the end of the first finger, you can hit 20 to 25 feet at a very high tide but most of the site is more like 15 feet deep. Open water divers can dive this site. However, the shallow depth makes this a challenging site if you don’t have your neutral buoyancy skills on point. We rate this as an intermediate dive because of the difficult entry and exit over the jetty rocks and the challenge neutral buoyancy control. If you can get close parking, you only have to climb over about 25-50 feet of jetty rocks. If you have to park far away, you’re in for a bit of a hike. No surface swim is needed here. This site absolutely must be dived at high tide. Anything less than high tide and you won’t have enough water to go diving in. We suggest bringing along a flashlight to look in all of the little nooks and crannies along the jetty rocks on the first finger. We have our tried and trusted dive lights that we recommend on our Gear We Use page. There is a local dive shop in the South Beach area of Newport where you can get air fills, dive gear, rental gear, and some repair services. Both north and south bayfronts in Newport have good food and good brew pubs. We have camped at the South Beach State Park several times while diving. It is a good place for SCUBA divers to base themselves while they are diving up and down the central Oregon coast. 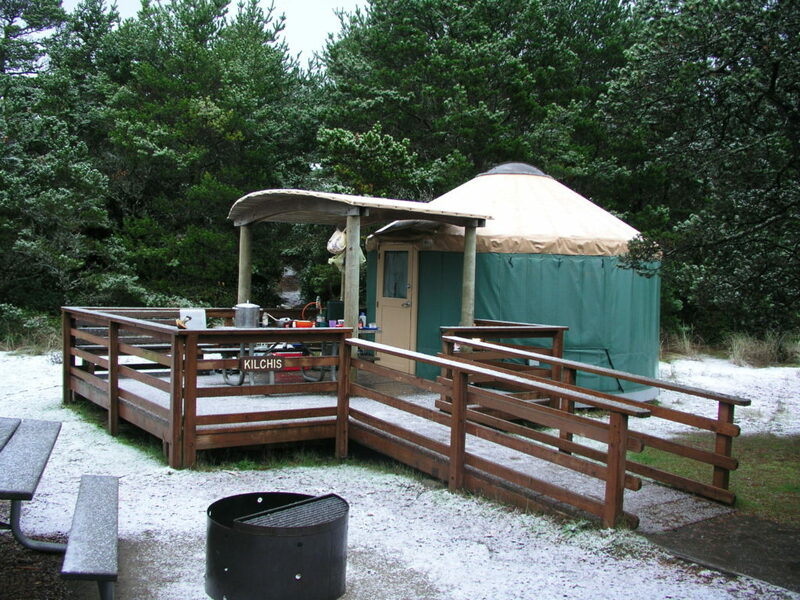 The campground also has great yurts for rent. We have not tried any of the hotels in Newport. If you have and you know of one that is friendly to divers, please let us know! South Beach State Park has great yurts that SCUBA divers can rent. The heaters in the yurts really are nice after a long day of diving around Newport.